Who would ever mistake me for "James Bond"? 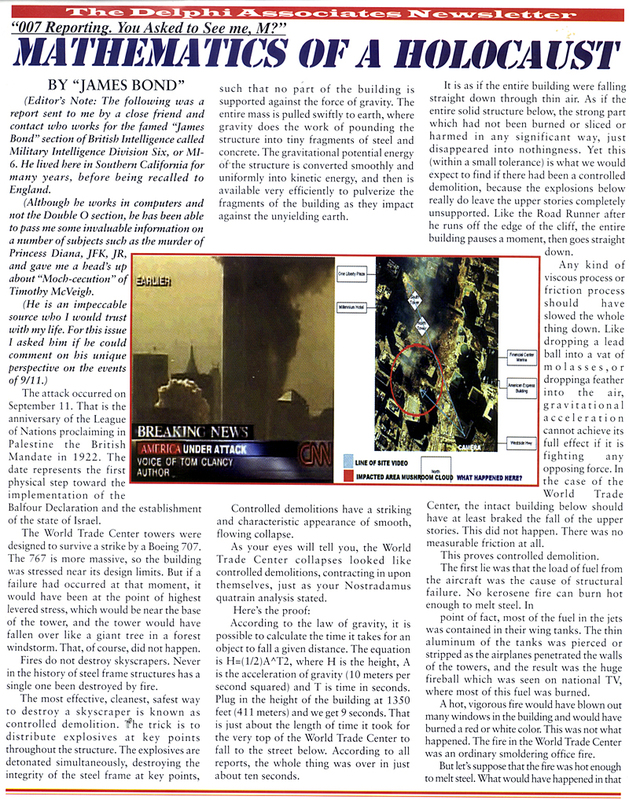 On March 31, 2002 (just in time for April Fool's Day) I posted an article to the Usenet entitled "Proof of controlled demolition at the WTC". In fact I indulged in some rather egregious cross-posting, in order to attract attention to my theory. I was sincerely convinced at the time that my arguments were correct, but as it turned out, the April Fool's joke was on me. The central argument in my essay was that the process of collapse should have involved enough friction that the fall of the building should at least have been braked significantly compared to the acceleration of an object in free fall. The argument seemed perfectly reasonable if not obvious to me, and I managed to trick some pretty smart people with it. But the truth is that it is possible for a building to collapse in a process which concentrates high leverage at certain joints in the structure. The result is a nearly frictionless collapse. This was very counter-intuitive to me, but people who work with structures seem quite aware of it. This technical article by Bazant & Zhou explains this in some detail, and although I believe their presentation is oversimplified, the basic message seems to be correct. My article also pointed out that it is historically unprecedented for airplane strikes and/or fires to destroy large steel-frame structures. My opinion is that this should be good reason to be suspicious about the official story (and I'm still suspicious at least to some extent), but many readers pointed out that there is always a first time for everything. They note that in many ways, the events of 9-11 were indeed historically unprecedented, so it was hardly fair of me to use precedent as if it were substantial evidence. 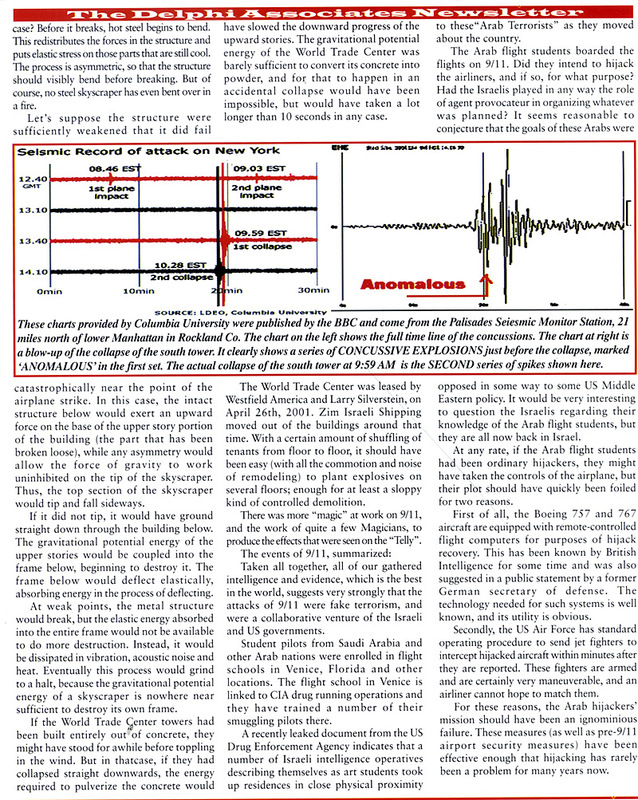 At any rate, I claimed to have proof of controlled demolition, and I certainly did not. In retrospect, I should not have posted the article without checking it with a structural engineer. But after all, it was only a Usenet post. I bravely waded through all the flames and insults in the many responses, and found that there was a residual level of useful feedback in the discussion. As soon as I understood my mistake, I posted a retraction. However, some people apparently liked my April Fool's article, exactly as it first appeared. It has developed a life of its own. It has been posted to Mark Elsis' Attack On America site. It appeared on Rense.com one day, but they were gracious enough to take it down at my request. It's gone out in private mailing lists, and been re-posted to the Usenet by others. I get a more or less continuous stream of e-mail about it. Every time I hear from someone, I explain and apologize for my mistakes in the article. Now the article has appeared again, but I am no longer given credit (or blame) as the author of the piece. In its latest incarnation in the Delphi Associates Newsletter (vol. 4, issue #81), it was written by a mole from inside the MI6 British intelligence service, writing under the alias of "James Bond". Under its new authorship, the article has been posted again to the Usenet. 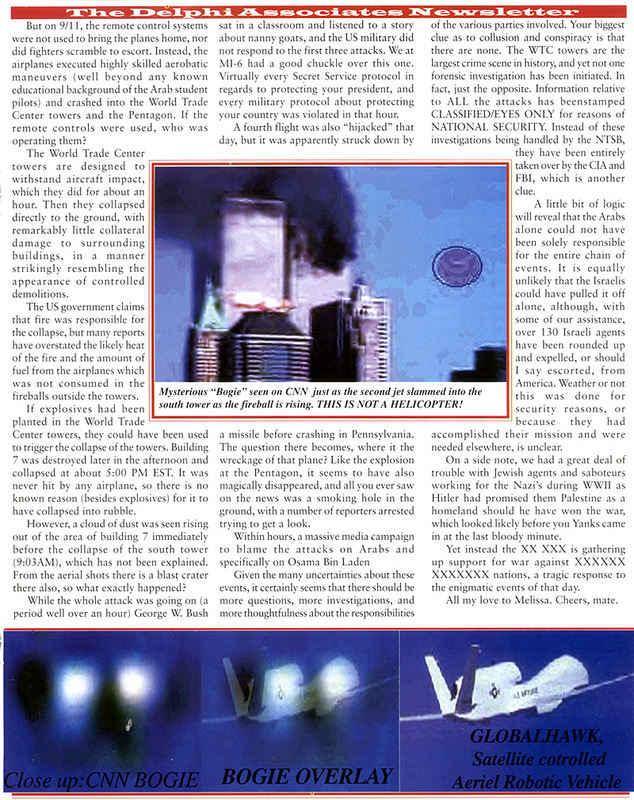 A reader of my web page alerted me to the situation, and he was also kind enough to send me a scan of the newsletter article, which appears here: page 1, page 2, page 3. But the article as it is published in the Delphi Newsletter is not exactly in its original form. There are a few additions -- for example, a mystical reference to Nostradamus, and an approving discussion of the French "Hunt the Boeing" web page. I suppose I did a good enough job of discrediting myself and my ideas, but "James Bond" has been able to add to the general level of hilarity by bringing in these other questionable threads. Update 6/9/2002: Mr. Morton did contact me, and we agreed that he would publish a follow-up letter from me, explaining the technical errors in the "James Bond" article.